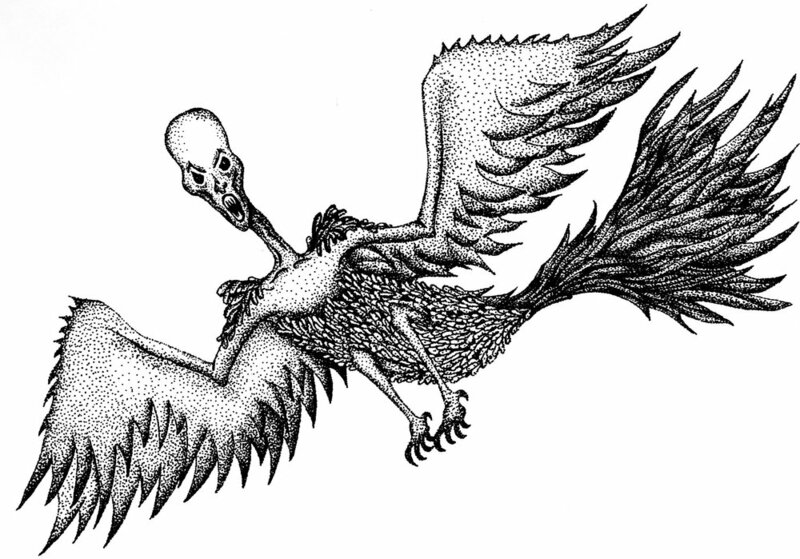 Image of a hulla: long curved neck, wings, and a human face. This monster (to me) is one of the creepiest. They have human-like faces, but the bodies of birds. They fly, and can sort of talk—but they’re also kind of dumb. One of the creepier parts of hulla is that they eat carrion—anything dead, too: monsters, humans, animals, you name it. They tend to sense when a battle or a big fight is going down, and they will fly around waiting for it to be over so they can feast. They rarely intervene in the actual battle, and when they do, it’s only because they think it means more food for them in the long run. They don’t care who wins in these situations, only that everyone involved dies. The good thing about hulla is that they aren’t after you when you’re alive. They’re also pretty soft and fleshy, so if you do want to kill one, anything sharp should do the trick. They will attack from above though, so watch out. Elnok is the Queen of the Hulla, and appears later on in the book. In Tentacles and Teeth, hulla & elnok play a pretty important role both the plot and Askari’s realizations about the extent to which humans and monsters can interact on a civil (or not) level, so I won’t go into too much detail about them because [spoilers!]. Instead, I’m going to talk about the drawing process a little. I knew hulla and elnok looked similar, and when I did the first drawing, I liked it so much I thought it was going to be the elnok. This was my fifth or sixth drawing, and I was getting a lot better the more I did. I loved the tail feathers on this, and thought the face was pretty good. Creepy bird with human face. But I still needed another drawing, and when I got about halfway done with the second one, I realized that no, the second one would be the elnok. It was crazy better (in my opinion), and I had given it hands, which made sense that the Queen would have hands and the minions wouldn’t, because [spoilers]. I loved the detailing on the wings of this monster, and the sort of neck feathers. I thought (and still think) it was so creepy and weird-looking. In other news, the book is now available!!! Click here to buy it on Amazon and read about all these monsters. Older PostLaunch Day of Tentacles and Teeth!